A new Bitcoin casino offering over 1000 games to play! Crypto Wild is a brand new Bitcoin casino that has over 1000 games. 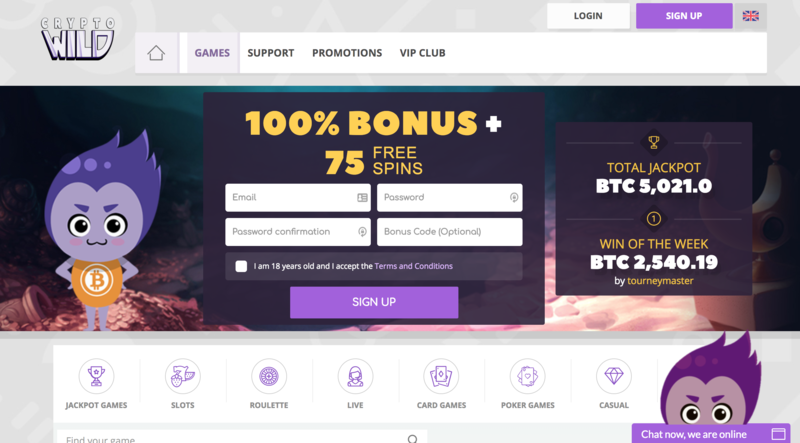 Crypto Wild are a very new Bitcoin Casino but offer a wide variety of games as well as a VIP club. The website accepts players only from countries where online gambling is legal. Players from Israel, Spain, UK or USA are unable to play real money wagering games. Casino games are minesweeper, BlackJack, Bitcoin Slots, Bitcoin Roulette and Bitcoin Craps. The website is simple and easy to use. Crypto Wild offer a 100% matched up to 1BTC welcome bonus and 75 free spins. However, if you visit Crypto Wild from a link on Bitcoin Gambling Reviews you will be eligible for a 200% matched deposit up to 1BTC. It will be automatically applied if you click through this link -> Crypto Wild. A deal worth checking out. Please double check the terms and conditions on the site but in short there is a 40x wagering requirement and the maximum bet size of 0.0025BTC while the bonus is active. Depositing is fast and easy either especially if you choose to use Bitcoin. Withdrawals can only be processed after the players identity has been verified. Withdrawals can take up to 3 days to process depending on the withdrawal method selected. Crypto Wild also offer a VIP club the rewards regular players with weekly cashback offers. Silver – 5% cashback, gold- 7.5% cashback and platinum – 10% cashback. Crypto Wild is a new Bitcoin casino that offers over 1000 games in many different categories. Sign up from this page and you will be eligible for a 200% matched welcome bonus. As this is a very new casino please leave a comment with your experience if you try them out!